Quinoa, quinoa, quinoa -- how do you find your way into so many things? Is it your yummy, nutty taste or the protein-packed punch that makes everyone want you so? 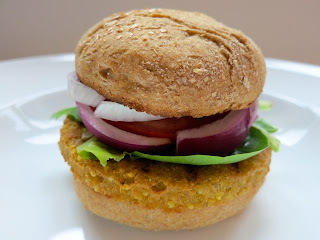 Either way, quinoa (keen-wah) has become a household ingredient over the past few years. Now, it is even showing up in burgers! 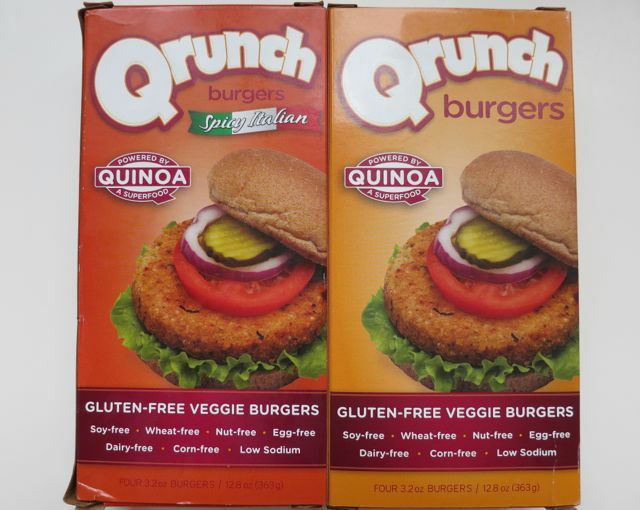 Qrunch Burgers is the latest veggie burger creation containing quinoa. 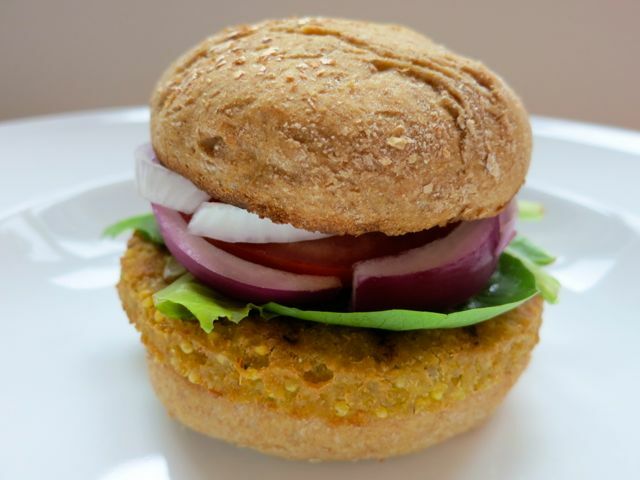 A small, but growing company based in Denver created these burgers to show the world that vegan burgers can not only taste good, but be good for you too. 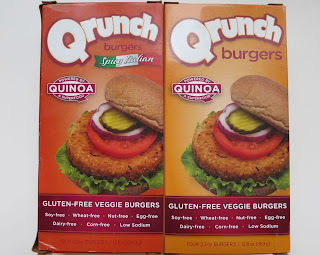 Well, they certainly aren't the first to make a good-tasting vegan burger, but they are one of the few using quinoa. 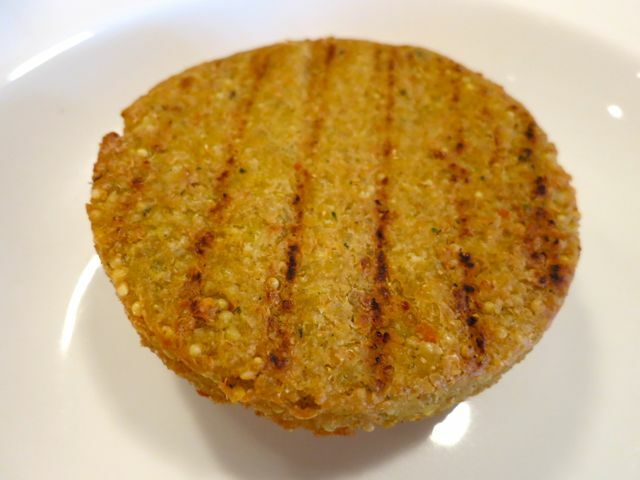 The burgers have a crunchy crust on the outside and are soft on the inside with a nutty texture. In terms of their texture, they remind me a lot of Hilary's Eat Well burgers. They are nice, neutral-flavored burger patties filled with lots of good-for-you stuff like millet, quinoa, carrots, broccoli, spinach, apple cider vinegar, and psyllium seed powder. They currently come in two flavors: regular and spicy Italian. As you might have guessed, I prefer the spicy Italian because spicy is always better! I topped mine with vegan mayo, mustard, lettuce, tomato, onions, and giardiniera (pickled peppers and veggies). Besides the great ingredients, I like that they are all-organic and free of the most common allergens: gluten, dairy, soy, corn, eggs, wheat, and nuts. They are currently sold in select Wegmans and Whole Foods as well as at Yes! Organic Markets in DC. To find a store near you, click here. They advertise quinoa but the first ingredient listed on the box is millet. They cleverly fail to list their ingredients on their website but talk about quinoa as if that is the main ingredient. Smoke and mirrors? It's similar product, with better ingredients (no canola oil), and I think the company has better business practices. Super tasty! Just had the Spicy Italian with a little marinara sauce. Yum!